An attachment is the enduring, emotional connection between one person and another. The child psychologist John Bowlby described it as the “lasting psychological connectedness between human beings”, and he identified how important good, early attachments are for our development into healthy, well-adjusted people. If a baby doesn’t make good attachments in her first 12-24 months, she may well suffer for the rest of her life – she may struggle to form meaningful relationships with people, might develop trust issues, struggle to regulate her emotions and maintain motivation and self-control. Children who have poor attachment suffer increased levels of stress and illness, are more at risk of ‘failing to thrive’, and have measurably reduced intelligence. Early attachments when we’re vulnerable, helpless infants form the template for all our later relationships, and they impact our understanding of our own place and importance in the world. For most of us, our strongest, earliest attachments are with our mothers and other primary caregivers. In a cycle of interactions and exchanges, you learn that you can rely on your caregiver to meet your needs. You cry, and someone will do something for you. There’s a threat, and your caregiver will pick you up, comfort you, protect you. You come to rely on their ability to keep you safe. Of course, anyone who has spent more than a few minutes with a normal, happy baby knows that normal, happy babies still get distressed, cry and aren’t always consolable. You might also have seen that sometimes caregivers won’t respond to their baby’s cries. It’s ok. A researcher called Allan Schore identified that healthy attachments have moments of disruption that are then ‘repaired’ by the caregiver and baby re-attuning. These moments of distress build a baby’s resilience and self-regulation, but ONLY IF they are followed by attentive caregiving. NOW: Imagine you’re in a crowded orphanage with rows and rows of cots with little babies and toddlers lying in them. There are no toys, no human voices, no colours, or sounds or smells. When the clock hits 12, a nurse comes in, changes a baby’s diaper, then give him a bottle of milk. She doesn’t stroke, cuddle or sing to him. He doesn’t make eye contact. Once the baby has finished his milk, he’s put back in his cot and the nurse continues to the next baby. The little baby may pull himself up on his crib bars, burble babytalk, smile, scream or cry. But whatever he does he gets no feedback, because the nurse is busy with the next baby. There is no ‘attunement’, let alone ‘re-attunement’. Now imagine a mother or father in a drug- or alcohol-induced stupor: They’re also emotionally unavailable. Imagine a caregiver who’s preoccupied by fear of their violent partner: Emotionally unavailable. Imagine a caregiver with fragile and unstable mental health and not enough support to help them care for their baby: Emotionally unavailable. This is not intentional abuse…but it is emotional and psychological neglect. Any circumstance where primary caregivers don’t have enough time, can’t adapt a routine to the needs of an individual, offer no loving physical touch or tenderness, and are emotionally disengaged, the child will suffer. At the most extreme end of the spectrum, it will result in brain damage – if you are severely understimuated, parts of your brain won’t develop, and parts of your brain will die. On the right is an image from Dr Bruce Perry’s research into the long term effects of trauma (www.childtrauma.org). On the left is a CT scan of a three year-old child raised in a healthy, stimulating environment. 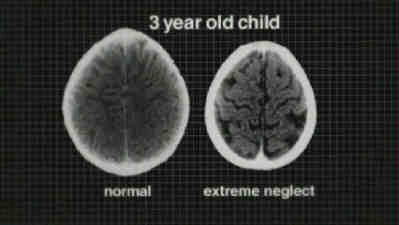 On the right is the CT scan of a three-year old child who has experienced extreme neglect. The neglected child’s brain is significantly smaller, it has larger internal voids and shows abnormal cortex development. The earlier, and more severe the trauma, the more global the impact on their development and the less potential to overcome that trauma. In the 1970s, a psychologist called Mary Ainsworth developed a laboratory test that is supposed to determine the quality of a child’s attachment – it’s called the Strange Situation, and is still used by child psychologists now when assessing families, and advising legal and medical professionals on the best way to help vulnerable children and their families. In brief, securely attached children try to seek out their caregivers when distressed, for example when left alone with a stranger in a room. They’re confident enough to explore new situations, because they know they can trust their caregivers to keep them safe. Avoidantly attached children aren’t as sure – they might ignore their caregivers, but also be demanding and less willing to explore and engage with interesting new people and things. Ambivalently attached children are anxious – when their caregiver leaves them, but also when their caregiver returns. Although an avoidant child might appear to be quieter and calmer, the levels of stress hormones coursing through their system are as high as the screaming, anxious ambivalent child. Silent, apathetic children are not content – they’re exhibiting a primitive response to avoid danger, or they’re indicating that even when they are in danger no-one cares or helps, so they’ve stopping crying, stopped avoiding, stopped doing anything. For more information on emotional intelligence, bonding, attachment and the impact of trauma, check out the portal atPhoenix Therapeutic Fostering and the Child Trauma Academy. With thanks to Gerry Byrne, child and adolescent psychotherapist and lecturer at Oxford Brookes University, UK for his time and advice.